"My daughter made these when she was in Brownies. These were quite a hit with the girls. You can use a lemon icing, green buttercream icing, or a peanut butter icing--or a combination of all." Cream butter and sugar together well in mixing bowl. Beat in eggs 1 at a time. Mix in vanilla. Measure flour, baking powder and salt into small bowl. Stir. Add milk to butter mixture in 2 parts alternately with flour mixture in 3 parts, beginning and ending with flour. Fill cones about 3/4 full leaving the batter 1/2 inch from top. Place filled cones on a baking tray. Bake in oven for about 15 to 20 minutes until an inserted toothpick comes out clean. 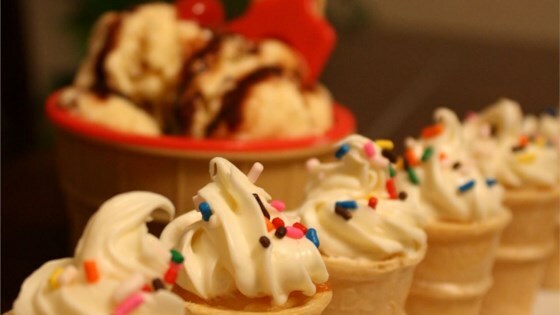 See how to make super-fun ice cream cone cupcakes! Works just a well with a cake mix. Just be sure not to overfill the cones as it will be a big mess. very simple and fun. I used boxed cake mix and the kids loved it. The flat bottom cones fit perfectly in a mini muffin tray. What a cool recipe when you want something special for children!! It's great to let the children go wild decorating them by themselves!! Works for both sophisticated entertainment (see photo) or fun kid parties. It doesn't taste extraordinary, but is a cute idea.